I have almost finished the back and both front pieces of the Hudson cardigan. This is a very simple, quick and straightforward knit, and almost all of it has been done during lunch breaks, a meeting and some lectures in the past two weeks. The Selbu gloves, on the other hand, is probably among the most complex knits I have done. I have finished one glove, and it is a bit wonky, so there will not be a close up at this time! But I have enjoyed every minute of knitting it, and can't wait to start the next glove. I have knitted some stranded projects before, but my technique has always been, well, undeveloped. I have never been able to knit with one thread in each hand, nor have I mastered knitting with both threads in the same hand. I have had to have the colour in use alone over my left index finger, and then let go of it and pick up the other colour, which totally kills the flow of the knitting process. How I managed to do this, this and this while applying this (lack of ) technique, is a mystery to me. 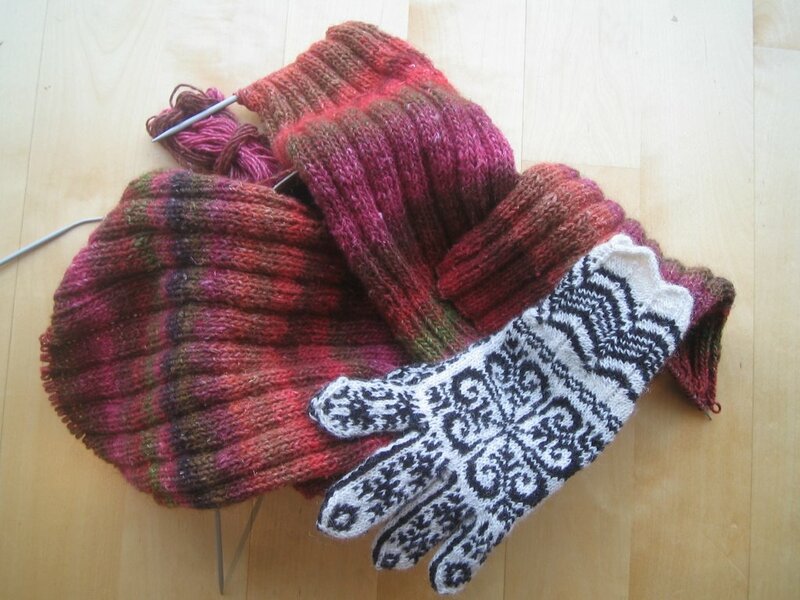 But halfway through the first glove, while knitting a killer row where the colours alternated with every stitch, the magic happened: For the first time I find myself knitting and smoothly alternating colours with both yarns side by side over my left index finger. I don't know how it happened. I have tried to study and apply fair isle techniques before, but I just couldn't figure them out. But suddenly, to my astonishment, I was just doing it! It's a miracle! My speed is picking up, but I need to work on keeping even tension. I also came across Nona's post about yarn dominance, and tried to apply it, but all these new skills were acquired more or less as I reached the fingers of the glove. Practising fair isle techniques with 20 stitches on 5 dpns, well, the conditons weren't good. So I'm going to use the next glove to practise and perfect my new skills, and I'll cast on as soon as I finish this blog entry. That glove is amazing! It's a tiny little work of art. If I were you I'd be tempted to frame it and hang it on the wall. ;-) It's done at a REALLY tiny gauge, I'm guessing--? I was really encouraged to read your post, maybe one day I'll have a lighting-bolt moment and be able to knit like that too! holy cow, that glove is beautiful. who cares about wonkiness (which i'm sure can only be seen by yourself, anyway) when you've created such a beauty!? Nydelig selbustrikk:-) Mannen min likte Durrow, ja. Så når skuldrene mine er klare, og jeg har fått ferdig et par andre works-in-mental-waiting-line tror jeg det blir Durrow-strikking på meg også. Kan det gjøres på rundpinne i stedet for frem og tilbake tror du? I echo what others have said. That glove does look like a little work of art. I haven't done much in the way of fair isle but, seeing such lovely things on people's blogs, I get the urge to have another go. I'd love to be adept at all the techniques, too. That must have been a great feeling when the changing the yarns thing suddenly clicked!